Sometimes you just need comfort food. It doesn’t matter if you are feeling down, tired from work or just got bad news, everyone has a few favorite dishes that are comforting. Most are pretty easy to make. My comfort food is Tuna Macaroni Casserole. When it is done right, it is creamy, crunchy and rich. 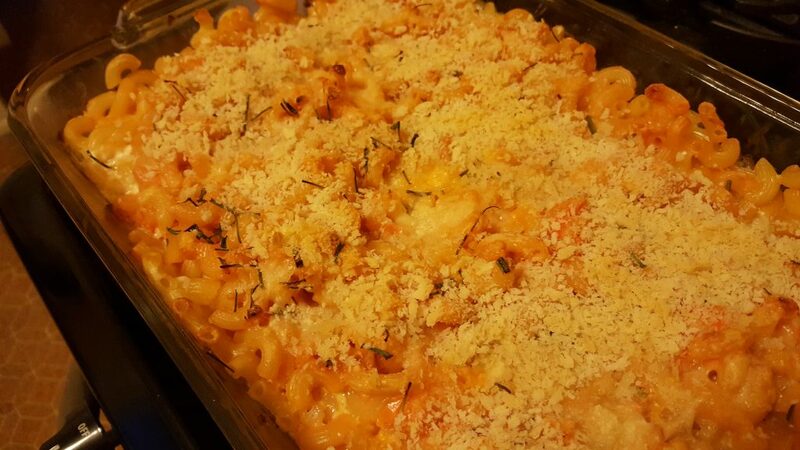 Originally my mom made it with elbow macaroni, milk, drained canned tuna, cheddar cheese and topped it with bread crumbs. There may have been some trademark named processed cheese food of the rectangular variety in it. By the time I was allowed to help make it, or at least stir the cheese sauce, it was just grated cheddar cheese. We always had it with Stewed Tomatoes. Sometimes canned, sometimes homemade. Toss everything in a casserole dish, bake it. Pretty easy. I’m not sure when mine got fancier than that. It was after college certainly. I’d be willing to bet I was out of some ingredient and decided to start substituting. The first thing to go was the elbows. I like a shape with more edges. Rotini and Farfalle are favorites, but sometimes all you have is elbows. Anything other than a straight shape is fine. Something has to hold onto the sauce! Then I started substituting port wine cheese for the cheddar. Instant pink mac and cheese! This became a hit with my dad and many clients over the years. It also made for a more kid friendly dish, or at least interested some of them enough to try a homemade mac and cheese rather than a boxed type. Milk, that’s for boring people! Time to use fresh cream from a local dairy. That was the next change. Though, to be fair, growing up mom used fresh whole milk from a (different) local dairy too. I still make it with milk (even nonfat) if someone wants to watch fat intake for health reasons, but it isn’t the same. Canned tuna I still use, upgraded to all white canned in water. Bread crumbs I still use also, usually mixed with some fresh grated Italian cheeses. My normal blend is Asiago, Parmesan, Romano and sharp Provolone. If I have cooked onions, fresh chives or mushrooms or maybe some spinach hanging about, I will toss those in too. I have tried cooked squash as part of the “cheese” sauce, but find it a bit sweet. That may be my squash choices, so I will continue to experiment. Still the basic version is the best. Eaten as a treat, it spells comfort for me.